England head coach Phil Neville has reiterated that nobody is safe as the countdown to the summer’s World Cup continues. While Neville himself admitted there is now a familiar look to his squads, the former Manchester United man is keen to guard against complacency and also sent a message to those on the outskirts of his squad on Monday. It’s almost two years to the day since former head coach Mark Sampson made a surprise early announcement of his Euro 2017 squad and while Neville is clearly not as much in a rush as his predecessor, he admitted the announcement could come before the end of the month. 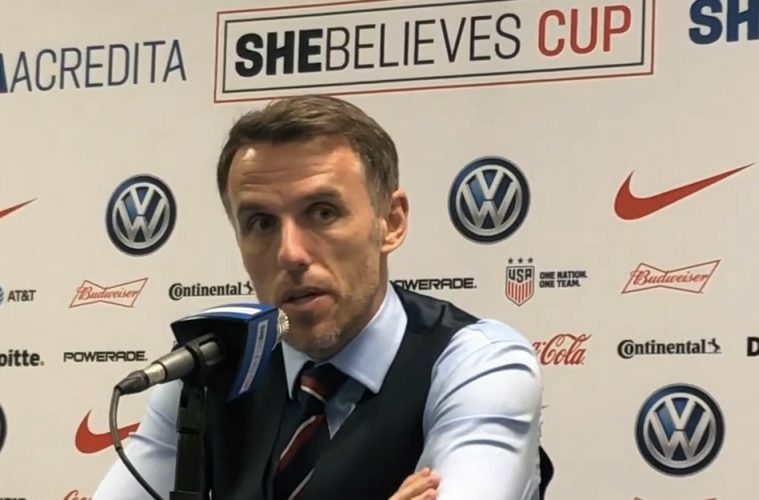 Despite making only necessary changes to his squad since the SheBelieves Cup success a month ago, Neville says no one is yet guaranteed a spot on the plane to Nice. But it appears Neville hasn’t yet ruled out someone breaking into his squad for the first time despite this likely being the final camp before the announcement and the final two “Road to France” friendlies after the end of the domestic season. The 42-year-old went onto say injuries can have an impact on squad selection and referenced several players who are in his thoughts. Neville was in attendance at the recent Chelsea–PSG game where Blundell scored a superb goal from right back while her Blues teammate England has been in fine form since returning from a successful loan spell at Liverpool. Birmingham City defender Aoife Mannion has won many plaudits throughout the season and Neville has sent a message to those to just “keep doing what they’re doing” ahead of the tournament and looking ahead to Euro 2021. “That’s what I’ve told Beth a few times now because she’s been so unlucky,” he said. “Aoife is so unlucky. I can’t go to Aoife, Beth, and Hannah and say ‘you need to do XYZ more’ because they are probably playing at their absolute maximum. Neville also made reference to some of the younger players he has taken on camps for experience purposes, particularly Manchester City forward Lauren Hemp. Hemp has returned to Under-19 duty to help Rehanne Skinner’s side qualify for this summer’s European Championships in Scotland after traveling to the SheBelieves Cup as a non-squad player alongside goalkeeper Sandy MacIver.